A touch sensitive low gain overdrive pedal. 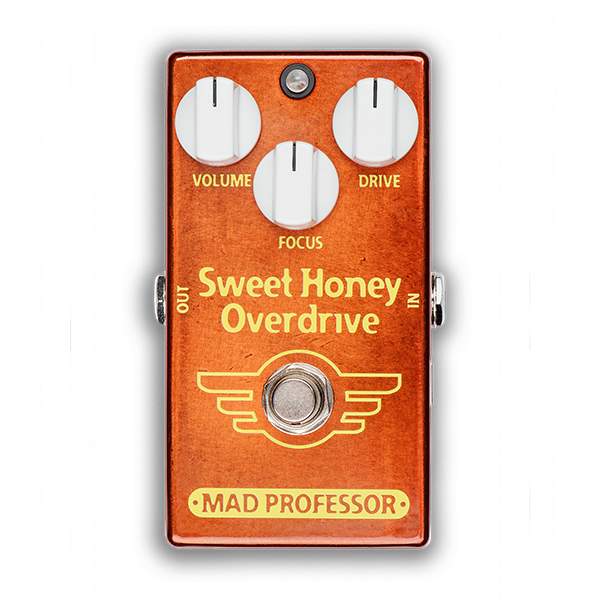 Mad Professor Sweet Honey Overdrive (SHOD) is a touch sensitive low gain overdrive pedal. It is designed to overdrive distorted amplifiers and give dynamically controlled light overdrive on clean sounds. Distortion level can be controlled by pick attack and pickup strength. Harder picking for overdrive and softer for a cleaner tone. With the unique Focus control, you can adjust the feel and dynamics of the pedal as well as overall EQ. Turning Focus CCW you need to play harder to get distortion and the tone is softer, great for jazz and blue. Focus turned CW gives a slight treble boost and earlier distortion. CONTROLS VOLUME: Sets the output volume. DRIVE: Controls the amount of overdrive. FOCUS: Controls how easily the circuit distorts as well as adjusting overall EQ. Turning CCW gives less distortion and a mellow effect, turning CW gives a slight treble boost and earlier distortion. Good starting point is 11 o’clock. ELECTRICAL SPECIFICATION Supply voltage range: 7,5 to 18VDC Current consumption: 5 mA at 9VDC Input impedance: 260K Output impedance: 25K Ohm’s Complete bypass (true bypass) True bypass or buffered (switchable inside the pedal) POWER REQUIREMENTS 6F22 9V battery or DC eliminator 2.1 mm plug center negative and positive sleeve. NOTES RRB is protected against wrong DC eliminator polarity. The fuzzy sound is a sign of low voltage. Maintain recommended voltage for best results.